The Innate Mind: Foundations and the Future. Edited by Peter Carruthers, Stephen Laurence, and Stephen Stich, 444 pp. (Oxford University Press, 2007). This is the third and final volume in a set of volumes on the subject of innateness, based on the AHRC Innateness and the Structure of the Mind Project. The extent to which the mind is innate is one of the central questions in the human sciences, with important implications for many surrounding debates. By bringing together the top nativist scholars in philosophy, psychology, and allied disciplines these volumes provide a comprehensive assessment of nativist thought and a definitive reference point for future nativist inquiry. 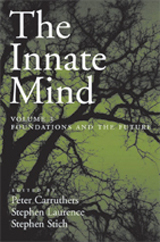 The Innate Mind: Foundations and the Future addresses such questions as: What is innateness? Is it a confused notion? What is at stake in debates between nativists and empiricists? What is the relationship between genes and innateness? How do innate structures and learned information interact to produce adult forms of cognition, e.g. about number, and how does such learning take place? What innate abilities underlie the creative aspect of language use, and of creative cognition generally? What are the innate foundations of human motivation, and of human moral cognition? The editors have provided an introduction giving some of the background to the debates about innateness and introducing each of the subsequent essays, as well as a consolidated bibliography that will be a valuable reference resource for all those interested in this area. The volume will be of great importance to anyone interested in the interplay between culture and the innate mind. "A set of penetrating investigations of a key issue in the understanding of the mind, one that is often embraced or denounced but seldom analyzed. This collection is a valuable contribution to philosophy, psychology, linguistics, and neuroscience." "This is a strikingly good collection, a real delight to read. I don't know how Carruthers, Laurence, and Stich did it, but they commissioned some of the smartest scientists and philosophers around to contribute their best work on several of the most exciting and cutting-edge topics. The result is a series of clearly written and fiercely argued papers on everything from the nature of creativity, the relationship between language and number, social cognition in babies, and the origins of morality." "Volume 3 is both a fitting conclusion to an enormously important project pitting nativist and empiricst theories of mind and an exciting opening to the future of this central debate on the character of mental life. It will be read by anyone who is seriously concerned with the question of what is innate and what must be learned." "This book collects and synthesizes some of the finest contemporary work on human nature and mind. Its contributors address some fo the diciest and most enduring questions concerning the origins of knowledge, the invariant and variable aspects of human nature, and the uniquely human propensity for creating cultures and new systems of knowledge. A wide range of perspectives is represented in these chapters, each with something to offer students of human nature. The three-volume series that this book concludes should be required reading for all current and aspiring cognitive scientists." Please see the AHRC Innateness and the Structure of the Mind Project’s website for more information about this project. Peter Carruthers, Stephen Laurence, and Stephen Stich. Introduction. Richard Samuels. Is Innateness a Confused Concept? Matteo Mameli. Genes, Environments, and Concepts of Biological Inheritance. Peter Godfrey-Smith. Innateness and Genetic Information. Thomas J. Bouchard, Jr. Genes and Human Psychological Traits. Gabriel Segal. Poverty of the Stimulus Arguments Concerning Language and Folk Psychology. Alan M. Leslie, C. R. Gallistel, and Rochel Gelman. Where Integers Come From. Stephen Laurence and Eric Margolis. Linguistic Determinism and the Innate Basis of Number. György Gergely. Learning “About” Versus Learning “From” Other Minds: Natural Pedagogy and Its Implications. Fei Xu. Rational Statistical Inference and Cognitive Development. Luca Bonatti. Of Pigeons, Humans, Language, and the Mind. Mark Baker. The Creative Aspect of Language Use and Nonbiological Nativism. Peter Carruthers. The Creative Action Theory of Creativity . Anna Papafragou. Space and the Language-Cognition Interface. Laurie Santos and Venkat Lakshminarayanan. Innate Constraints on Judgment and Decision-Making? : Insights from Children and Nonhuman Primates. Chandra Sekhar Sripada. Adaptationism, Culture, and the Malleability of Human Nature. Karen Wynn. Some Innate Foundations of Social and Moral Cognition. Daniel Kelly and Stephen Stich. Two Theories About the Cognitive Architecture Underlying Morality. Jonathan Haidt and Craig Joseph. The Moral Mind: How Five Sets of Innate Moral Intuitions Guide the Development of Many Culture-Specific Virtues, and Perhaps Even Modules.